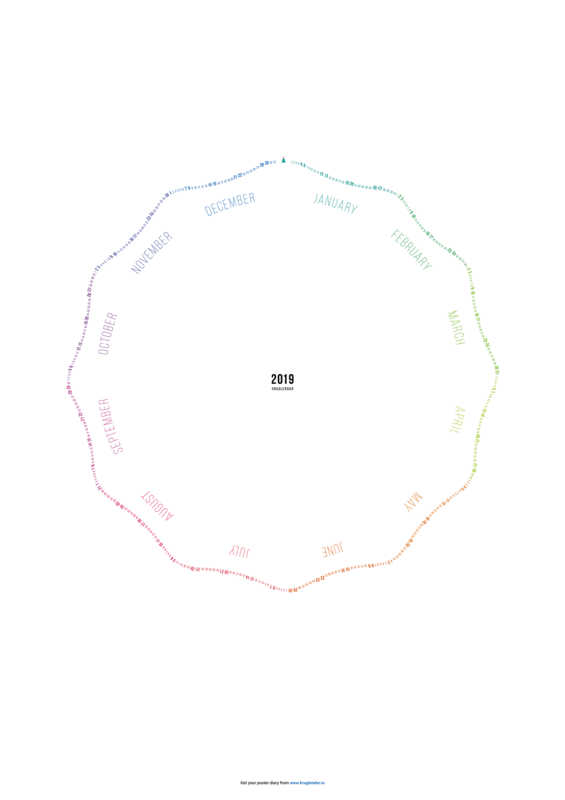 A convenient way to have a general view of the whole year. Stick the poster at your workplace or in your bathroom with a marker nearby. You can use it to jot notes about past and future events, but it’s much more than just a simple planner or calendar. The Kruglendar allows you to document important moments in your life, your achievements, your adventures, and your goals for the future. It’s worth keeping the Kruglendar even after the year ends as a memory of your experiences. With the Kruglendar, you will never forget to buy presents on your friend’s birthday or flowers on your anniversary. You can mark concerts, exams, and sport events that you don’t want to miss. The best way to reach a goal is to set a deadline and feel it approaching. Set milestones to your projects to finish them by the deadline. Mark departure and arrival times, keep your to do list linked to your calendar. Uh, right, you are not actually going to take the calendar with you to your journey, but it’s still helpful. Play the “making habits” game! Make a checklist of 1—3 tasks to do daily. Mark the days when you accomplished everything you aimed to do. Read at least one page of a book. When you feel you’ve made it a habit, remove it from the checklist to start a new one. Sometimes you know an approximate event date only. Draw it somewhere around dates, far from the circle. It allows you to make approximate plans, to note long term events like reading books or taking courses. Help the project, spread the word!